This page is under construction. In the meantime, here is a picture of a Zilog Z8000 microprocessor, the machine for which Dyalog version 1.0 was implemented, in a joint venture between Dyadic Systems and Zilog. It is probably also worthwhile explaining why images of ducks appear here and there on this site, our Facebook page and other places. The story is that, when the first support for graphics was added to Dyalog in the early 90s, the first sample code used the outline of a duck as an example. Initially just a simple outline, the duck morphed into polychromatic rotating bouncing ducks as graphical capabilities increased, and they were always one of the first tests performed on any new hardware. 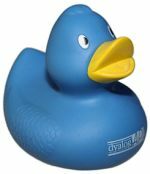 The duck motif has been associated with Dyalog Ltd and Dyalog ever since.